Congratulations everyone, we’ve survived another Black Friday and Cyber Monday. All indicators seem to reflect that 2012 is going to be a banner year for retailers and that is certainly good news for our economy. I’ll readily admit that I love a good deal as well as the next gal – my nickname in certain circles is “Shop-Dot-Kim.” However, each year, as the holiday season approaches, I find myself a little disappointed by the commercialism that emerges as we all tee-up for the manic rush to buy… buy… buy! I am not above the fray here. I have my websites that have trained me, like the rats in a lab experiment, to compulsively log-on when their daily deals are released. My two current favorites are One Kings Lane and Joss and Main . In the interest of full disclosure, I took advantage of both these sites this past Cyber Monday and scored some great deals for Christmas presents – as well as a killer throw for 70% off. My sun garden. We planted this garden just before my son graduated from high school almost four years ago. It has yielded some of the most beautiful peonies, irises, and lilies I have ever seen. Every year I seem to find a new flower peaking up through the foliage. 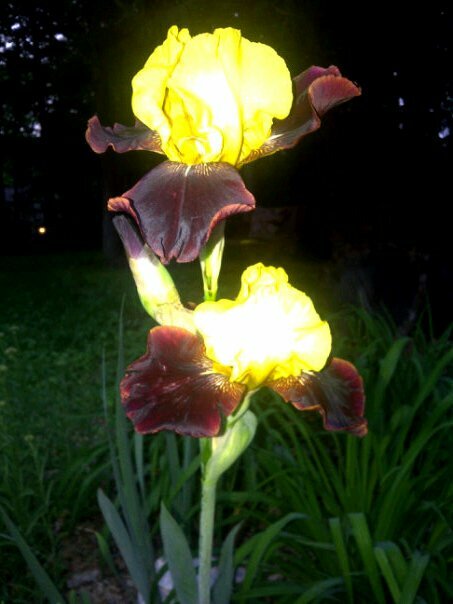 I’ve even managed to cultivate a garnet and gold iris (Go Noles!). A good cup of coffee. I really love coffee. There is nothing better than a well-brewed cup of Joe on a cold morning. The silence after a snow fall. I was born and raised in Florida, so I didn’t come to appreciate the beauty of a snow covered landscape until much later in life. Before the shoveling, after the storm, there is a wonderful moment when the world seems to briefly stop and everything is quiet and calm. My son’s killer smile. Jimmy’s whole face lights up when he smiles. His eyes dance and if he’s also laughing it’s incredibly infectious. The sound of my gal pal’s laughter. 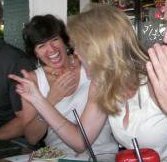 Speaking of laughter, I LOVE being in a room, or at a bar, with my gal pals and we’re all laughing uncontrollably. A clean house. Every once in awhile the house is exactly the way I want it to be: the laundry is done (and folded… and put away), the dishwasher is empty, the beds are made, and I just go “ahhh….” This doesn’t happen nearly often enough. A great romantic movie. If Pride and Prejudice is on TV, I will stop and watch it every time. Mr. Darcy never ceases to intrigue me. A really good “guy flick”. I also have a weakness for well-made action and adventure movies. I’m a sucker for films like The French Connection, The Dirty Dozen, or any of the Indiana Jones franchise. Listening to my parents tell stories. I never get tired of hearing about Florida in the 50s or my Dad’s baseball playing days or how my Mom rebelled against the nuns. A weekend when all my football teams win. This list has expanded from the Florida State Seminoles and the Dolphins to now also include Penn State and NC State. It’s not very often that all these teams all win on the same weekend (especially the Dolphins – come on boys!). So, how about you? What would make it on to your top ten “gratitude inventory” for 2012? Hi Kimba, This year seems to go by without me seeing too much of the frenzies of the malls and stores. I guess I am able to plan my shopping experiences and since I usually do it early in the week, things are quiet. I noticed that people has put the decorations out earlier this year…it indicates good spirit! I loved reading about what you are grateful for! I'd love to live close by cause i know i'd visit you a lot! You are the type of friend one can dream to have! Nathalie, you are such a positive force, I bet folks would decorate early just to see your smiling face! Hey, how about a WOFB Retreat – wouldn't that be kinda fun and we could get to meet in person? Thx Jacs! Hope you have a great holiday season too. Great post! I love One King's Lane too. Thank you for sharing your gratitude list–for me it's definitely chai tea, my dogs, and friends and family. I'm not a big fan of tea but I do like Chai! I've scored a few things from OKL lately, love when they have their blow-out sales! My daughter's smile is another of my favorite things – my son's is more of a cute little smirk, but Loretta's lights up her whole face like Jimmy's does. Thanks for sharing your list and making us all think of our favorites! Kathi, I bet your daughter has a smile and a laugh just like yours! I love your gratitude list. As for now, I haven't shopped for the holidays, but each new year brings me closer and closer to the simplicity of the holidays. I like to shop local and support the local artisans. I definitely like to shop local – especially the local shops that support me all year by carrying my book. I am very grateful and easily spend any royalities on their great merchandise. Thanks Suzanne for reminding all of us to spread good cheer (and maybe a little cash) at the local establishments that make up our neighborhoods. Love your list Kimba. Might I suggest for your "guy flick" that you check out the latest Bourne movie. If you've followed the trilogy at all, you won't be disappointed. And if you didn't, you won't be in the dark. I really loved it. I shared my own list over on my Success for Solopreneurs fan page around Thanksgiving. Counting my blessings and listing what I'm thankful for is always such a fun activity. I fellow coffee lover – Marquita I KNEW I like you!! I love the way my grandson laughs, especially when he's cracking himself up! I love to see my two grown kids hang out together. They are polar opposites and distance has grown between them but every once in a while they'll remember the things they have in common and just enjoy being together. The list continues but…. those are the two things that are on my heart today! Jean, that is so funny because my Mom says the same thing about now seeing my bother and I hang out together: how fun it is for her to see us interacting and loving each other as adults. And, I am sure your grandson is a doll! I just don't do the craziness of the holiday shopping. We went to two stores on the Sunday after Black Friday and nailed nearly all our Christmas shopping for our girls and the rest is done online. I also adore Garage Sales and up/recycling what other no longer want 😀 I have just done a 30 days of gratitude challenge on my Facebook page and I feel so full of gratitude for my life right now! Louise, take your time with the chart – I know it will be very interesting and insightful; just like you!